Out of curiosity, I've been wearing a heart rate monitor to yoga classes for the past six weeks. 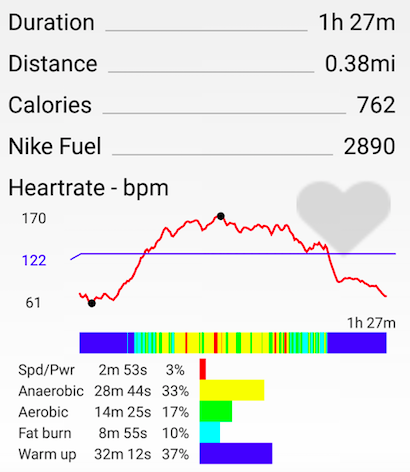 I've got lots to say about all the data I'm gathering, but first I'm just going to show what my heart rate is doing over a typical rocket yoga practice. Some background information about rocket yoga and my general level of fitness first. 'The Rocket' is a fast paced practice with plenty of inversions and challenging sequences which initially seem absurd but quickly become addictive. I've been practising rocket about 2-3 times per week for a few years and qualified as a teacher last summer, but I would describe my practice as 'approaching competence' rather than 'advanced'. I used to do triathlons and play football, but these days yoga and cycling to work is the only exercise I get. My resting heart rate is around 50 beats per minute (bpm), which is apparently pretty good (i.e. low) for a 36 year old. Yesterday morning I practiced at home, the picture on the left shows my heart rate from start to finish. How hard am I working here? Well, pretty hard. My aerobic zone (about 120-145bpm) can be considered 'moderate' effort and I'm there for around 14 minutes. But I spend 28 minutes working 'hard' (in my anaerobic zone, 145-165bpm) and nearly 3 minutes working 'extremely hard' (the red speed/power zone, over 165 bpm, or 90% of my max heart rate). I burnt 760 calories, even though I spent the first 9 minutes doing very little and the last 10 minutes lying on my back. In short, it was a proper workout. You might be wondering what I was doing at the peak? Well, although handstand and some other arm balances got my heart rate up, you can see about 90 seconds into the clip below it was a relatively innocuous looking pose that had my heart pumping the hardest. I don't know if my heart rate climbs in Anjaneyasana because I'm back bending, because it's towards the end of the standing sequence or because my arms are above my head and I have tight shoulders. I also don't know what the data would look like for someone with more or less yoga experience, or how it compares to other kinds of exercise for a similar period of time. This is all stuff I intend to write about in future posts.